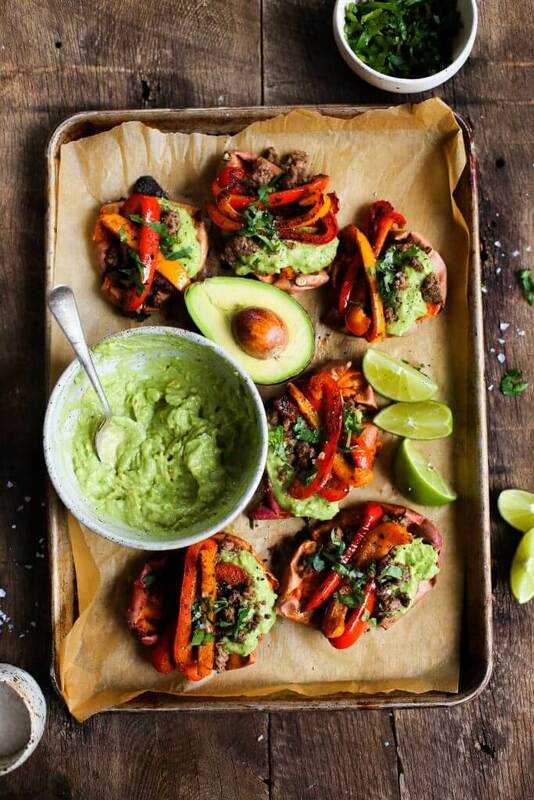 Easy vegan fajita smashed potatoes. 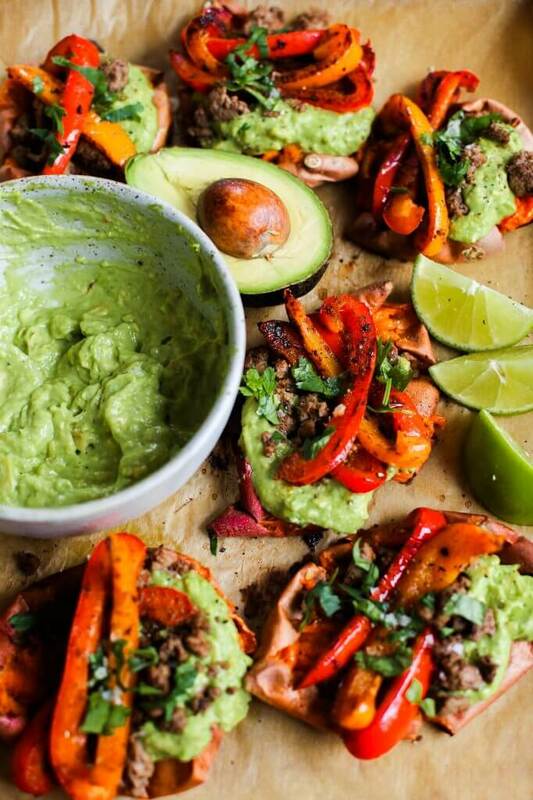 This easy whole30 and paleo sheet pan dinner is delicious served with creamy avocado lime dip. 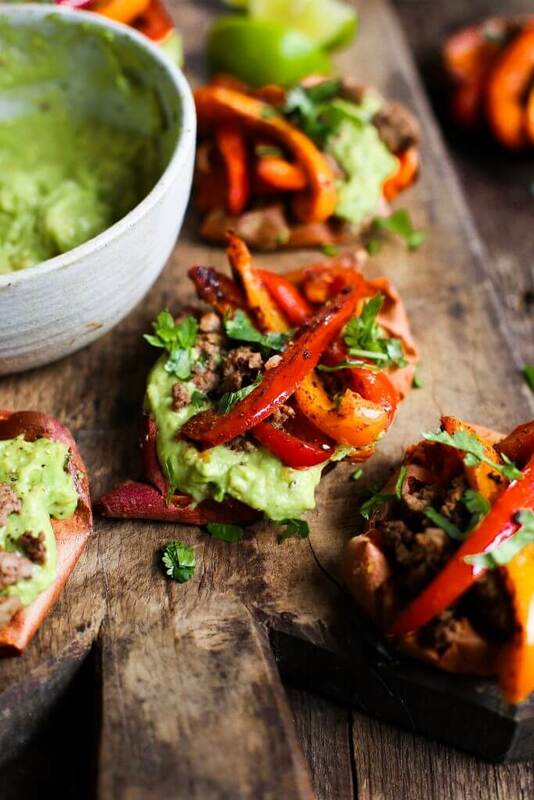 Smashed baked sweet potatoes with fajita seasoned bell peppers. This lunch has me going back for seconds. I’ve been loving all these sweet potato recipes lately, because who am I kidding, I’m in love with sweet potatoes! 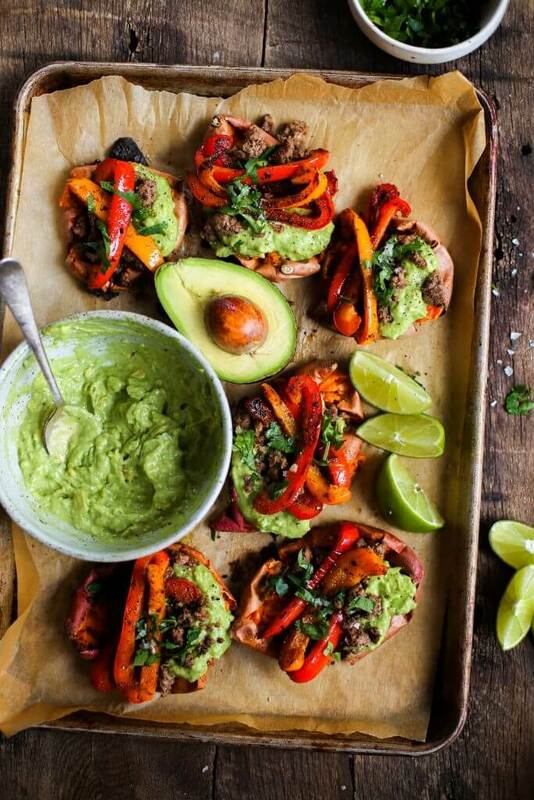 The versatility of this recipe makes it perfect for meal prep. 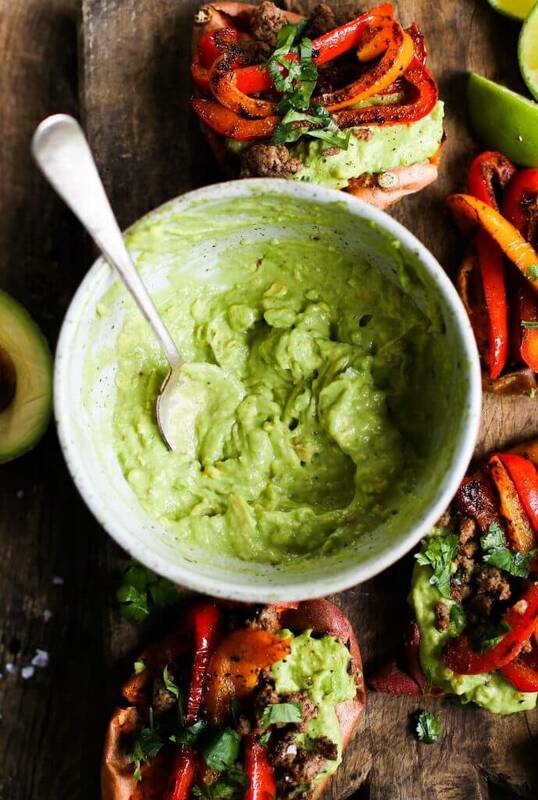 I love piling on all my favorites: avocado lime dip, fajita bell peppers, and extra cilantro and lime. My favorite way to serve these smashed potatoes is making a bed of greens, then piling on all the toppings- olives are also a perfect pair for this dish! smashed potatoes- the perfect meal. 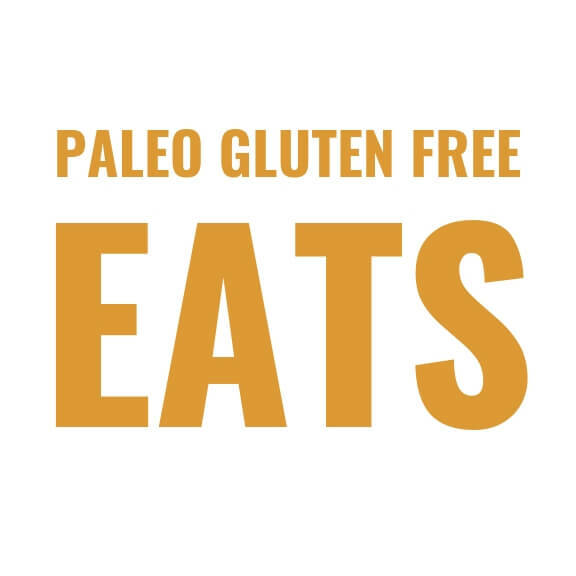 If you’re vegan or whole30… or just like to eat, then this a perfect family meal. Or if you’re sporting that single life, then prepare for lunch to be all meal prepped for the rest of your week- not mad about that! Boy, it’s been a minute since I did any of those, yikes! Then all you have to do is mash all ingredients together with a fork in a bowl and serve with the sweet potatoes. Avocado Lime Dip Recipe- Linked here. Preheat oven to 425F. Line a baking tray with parchment paper. Poke each sweet potato with a fork or knife then set on a baking tray. Bake sweet potatoes on 425F for about 40-50 minutes until soft when poked with a fork. Then take the tray out and slice them down the middle and smash the potatoes out, then put back in the oven to bake for another 20 minutes. 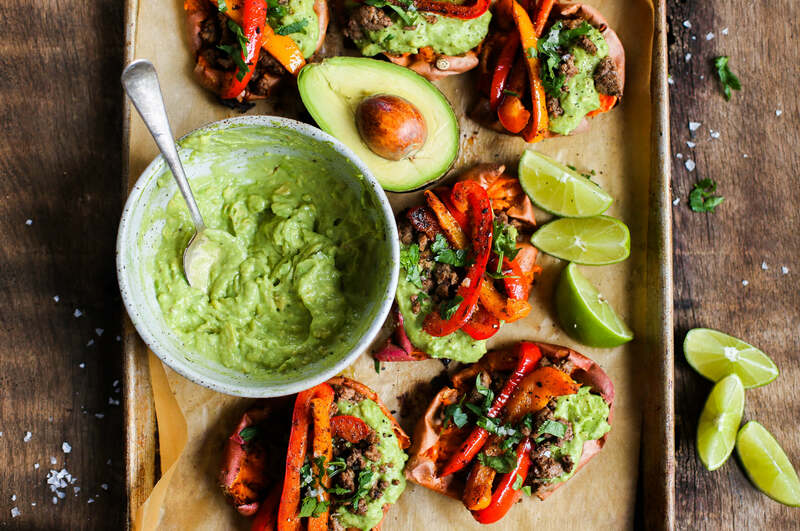 Slice bell peppers into strips, then saute in a skillet oven medium heat with a drizzle of olive oil, cumin, chipotle powder, and salt. Cook for about 5-8 minutes until soft. 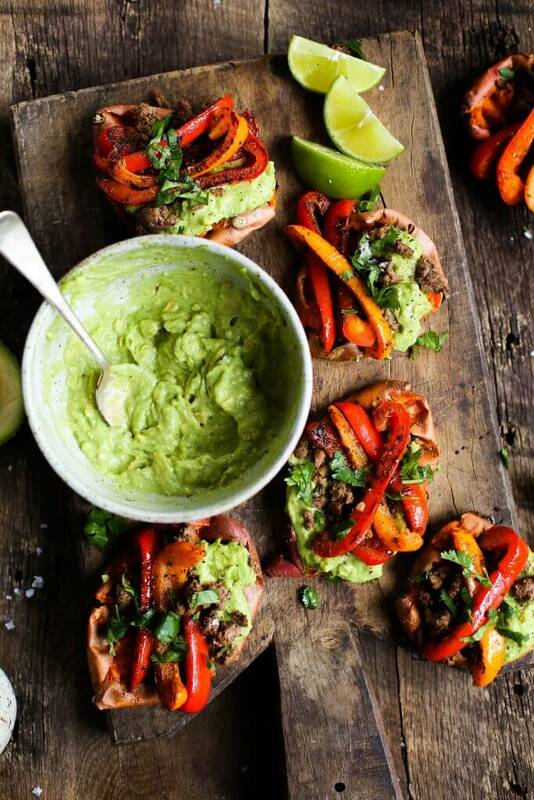 Prepare avocado lime dip (recipe linked in recipe notes), and assemble the sweet potatoes with bell peppers, avocado dip, cilantro, and lime juice. You can add a protein of choice, if wanted or go vegan.